Fresh off the most challenging case of her career, The 7th Victim heroine and renowned FBI profiler Karen Vail returns in an explosive thriller set against the backdrop of California's wine country. Hoping to find solace from the demons that haunt her, Vail makes her first trip to the Napa Valley. But shortly after arriving, a victim is found in the deepest reaches of an exclusive wine cave, the work of an extraordinarily unpredictable serial killer. From the outset, Vail is frustrated by her inability to profile the offender-until she realizes why: the Behavioral Analysis Unit has not previously encountered a killer like him. As Vail and the task force work around the clock to identify and locate him, they're caught in a web knotted with secretive organizations, a decades-long feud between prominent wine families, and widespread corruption that leads Vail to wonder whom, if anyone, she can trust. Meanwhile, as the victim count rises, Vail can't shake the gnawing sense that something isn't right. With the killer's actions threatening the Napa Valley's multi-billion dollar industry, the stakes have never been greater, and the race to find the killer never more urgent. And through it all, a surprise lurksone that Karen Vail never sees coming. 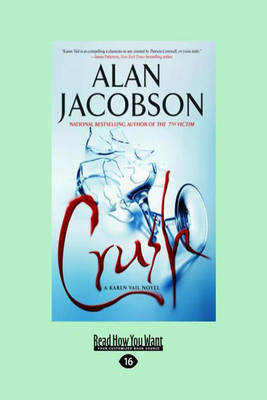 Meticulously researched during years of work with the FBI profiling unit and extensive interviews with wine industry professionals, bestselling author Alan Jacobson delivers a high-velocity thriller featuring the kind of edge-of-your-seat ending that inspired Nelson DeMille to call him "a hell of a writer."